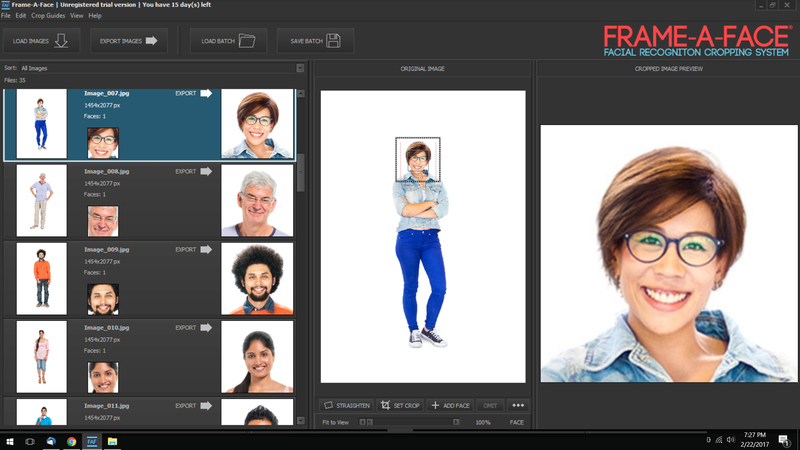 Frame a Face uses advanced facial recognition technology to isolate a subject's face. The user sets the dimensions and the system takes over, cropping hundreds of images in just seconds. 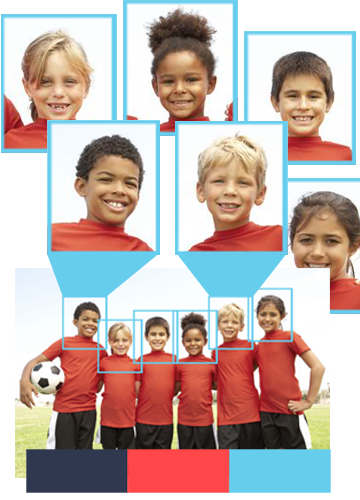 Frame a Face packages the facial recognition technology in a user-friendly interface. It is the most advanced automated cropping system available and the easiest to use. 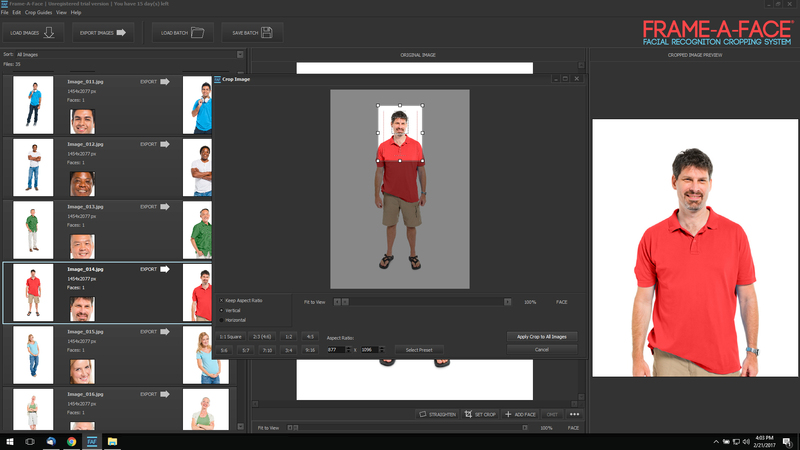 Or Extract Multiple Portraits from One Image. 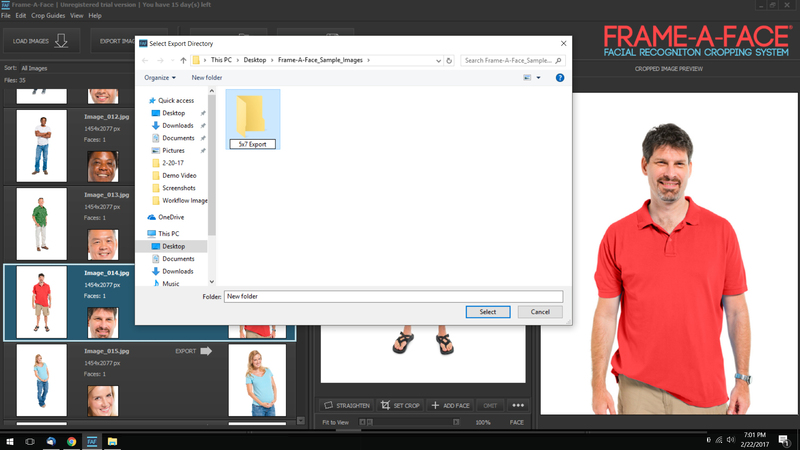 in just minutes, cropping each image to a uniform size. 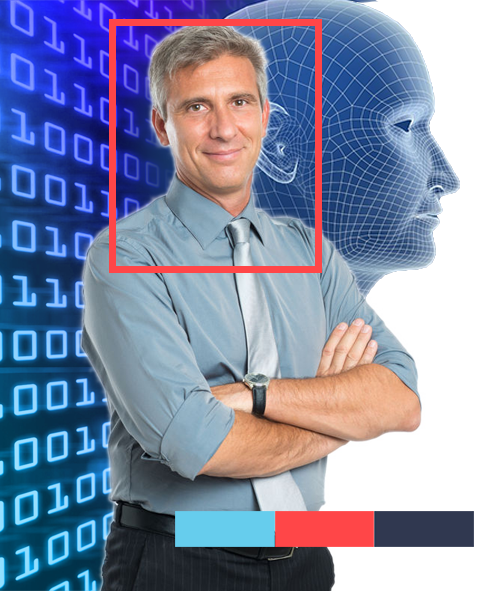 Frame-A-Face uses advanced facial recognition technology to isolate a subject's face. The user sets the dimensions and the system takes over, cropping hundreds of images in just seconds. 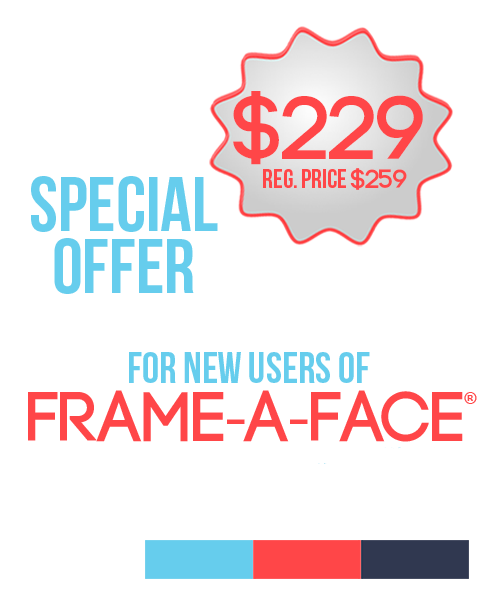 For a limited time, you can puchase a Frame-A-Face 2.0 license for only $229. This is the full-featured version of the software. set the cropping parameters and let your computer do the work. portraits in a matter of minutes. While you sit back and enjoy your coffee! Try Frame-A-Frace FREE for 15 days. with all the bells and whistles. Frame-A-Face is powerful, yet affordable. Currently only $229 per workstation. Call or email us here. 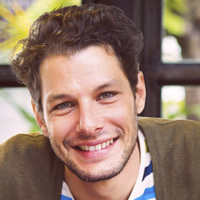 Frame-A-Face can cut valuable time from your current digital image workflow. and apply user-defined crop dimensions. as well as direct worflow application of the software. and try it in your workflow FREE for 15 days. After Frame-A-Face launches, click on the “Load Images” button. Browse to the folder with your batch of images and be sure to select all, using "Ctrl" key + "a" key. Choose an image from the image tiles that is most representative of the batch. For example, one that is centered with good headroom. Click the “Set Crop” button in the original image preview pane. This will be the master crop for the batch. Set the dimensions and use the controls to draw the crop box. Click the “Apply Crop to All Images” button. Scroll through your batch to make sure that the crop has been applied correctly. You can make individual adjustments in the preview panel. Adjustments made here will only apply to the selected image (will not apply to batch). When your batch is ready, click on the “Export Images” button. You will be asked where to save the images and Frame-A-Face will export your images with the crop applied. 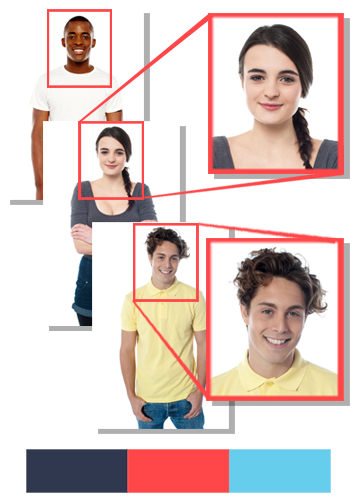 Scroll through the image tiles and review the new head and shoulders crop for ID cards. Make adjustments as needed. When you are satisified with the crop placment, click on the "Export Images" button. This time, Frame-A-Face will save the entire batch of images cropped for ID cards. Your images are now ready! In a matter of minutes, we created two folders, each with a different set of cropped images. One set is ready to send to the printer to fulfill customer orders and the second set can be used to batch fill ID cards. Congratulations! By implementing Frame-A-Face into your workflow you just saved yourself time and money. 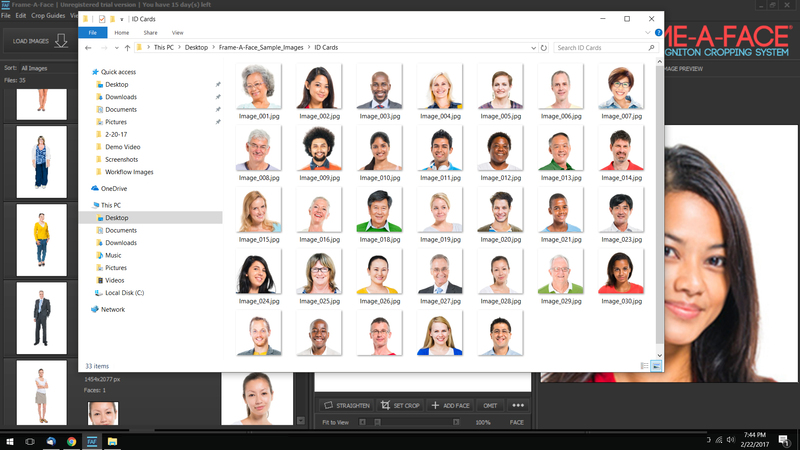 The Frame-A-Face facial recognition cropping system is quickly becoming an essential tool for any photographer in a high-volume production environment. This includes large image processing centers, as well as local photographers who just contracted their first school or sports league. Many processes in a high-volume digital workflow are still repetitive, where adjustments are applied to each image in a large batch. Frame-A-Face uses facial recognition technology to take one of these workflow processes—in this case cropping—to the next level of automation, cutting time from image processing and saving money. This quote from the legendary designer summarizes the Frame-A-Face user experience. 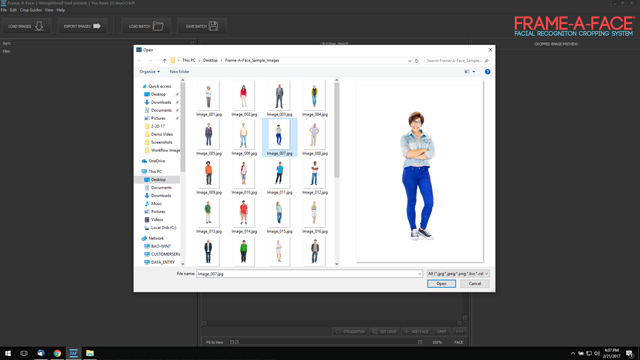 Frame-A-Face automates a mundane task (cropping/resizing hundreds of images) with elegant, intelligent easy-to-use software. Are you ready to experience the next generation of smart workflow? What Do Customers Say about Frame-A-Face? The following testimonials are from customers currently using Frame-A-Face software in their workflow. Everyone who uses Frame-A-Face agrees that the user interface is intuitive and easy to use, while the software itself saves vaulable time during image processing. 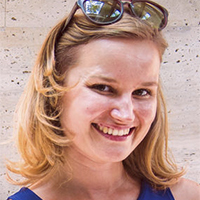 "The user will intuitively understand how the software works and the actual image processing appears to be magic. This is the way software should work." "I take photos for several schools in my area. I used to crop just about every image in Lightroom. Now I batch them through Frame-A-Face. One batch for ID cards and one batch for portraits. I cannot even begin to calculate the amount of time it saves! " "We have saved so much time since the IT department installed Frame-A-Face. We use it every day and I can't imagine going back to our previous system. It is so easy to use!" 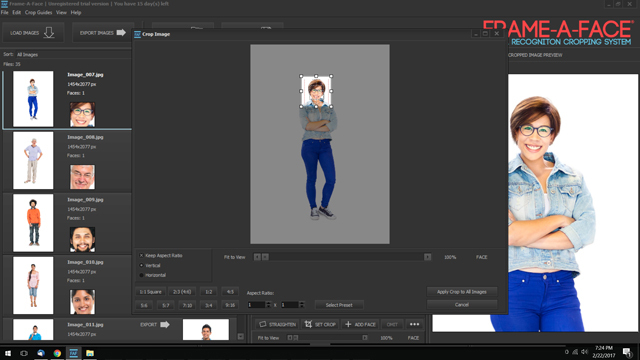 For a limited time, purchase the Frame-A-Face cropping system for only $229.00 This software will revolutionize your digital portrait workflow, saving time and money. Not convinced? Try the full version of Frame-A-Face free for 15 days. New Users Take an extra $30.00 off! Please use the web form below to contact us via email. We do our best to answer all email within one business day.